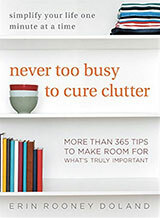 This installment of the 2008 Unclutterer Gift Giving Guide focuses on gifts under $35 that can help others organize the home or office. If you’re going to buy something tangible, we suggest getting gifts that work with our motto: A place for everything, and everything in its place. Shredding scissors. If you don’t have the space for a shredder, or are in the market for a non-electric option, these scissors will shred important papers quickly for you. DYMO LetraTag Plus Labelmaker. Label files, workbench peg boards, and your cat (although we don’t recommend labeling your cat). Identifying where objects reside makes returning objects to that place even easier. Driinn Mobile Phone Holder. 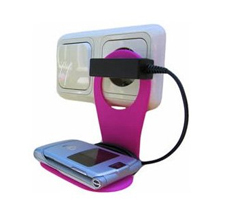 Keep charging cords out of the way and create a permanent home for your cell phone with the Driinn Mobile Phone Holder. We linked to the hot pink version, so be sure to choose a different option if hot pink doesn’t mesh with your decor. Velcro cable ties. Cables of all kinds can easily be wrangled into an orderly state with these simple ties. Anyone with a computer has a need for these velcro strips. Do you have any small, useful, and inexpensive recommendations to add to our list? Let us know about them in the comments. The Dymo Letratag link takes me to Amazon.com, where customer reviews are not very encouraging! In home depot you can find velcro spools and/or pre-cut velcro bundles that give you around 100-200 ties for the same price as the belkin 6 pack. They are not as pretty, but much more economical. @Cindy — I have a DYMO labelmaker and it works great. I’ve got a shredder that has a 6×9″ footprint. Takes up less space than a coffee machine. @Carl — I think the shredding scissors would be perfect to keep right by the front door. They are much easier to store than a shredder, and they could be used daily to cut up the credit card ads that come in the mail. Snip, snip, snip and into the trash. Junk mail wouldn’t even need to come into a home. I also think that they’re great for people in small spaces who don’t necessarily have enough room for a standard shredder. Also perfect for a dorm room, where probably not a lot of things need to be shredded. carl – i gave these scissors to my grandparents a few years ago. they spend a few months a year traveling and use it almost daily when they’re away from home. Home Depot also sells Cable Cuffs, aka Cable Clamps. They’re more expensive than the velcro tie wraps, but are much quicker to place and remove, since you don’t have to wrap the loose end over and over whatever it is you’re wrapping. I’ve used velcro tie wraps, zip tie wraps, and cable cuffs extensively over the years, and the cable cuffs are definitely my favorite. If not much needs to be shredded in a dorm room, then those scissors would really be unnecessary. Tearing something by hand would be the way to go. Dorm rooms just don’t have enough storage for a bunch of tools and products that are rarely used. I like the idea of filling a reusable container (such as a bucket, CD case, plastic drawer set, or trash can) with consumable products (like office supplies, gift cards, music, candy, organic cosmetics). I love my DYMO labelmaker too! I would have been happy gotten it as a Christmas gift. Now that I bought one myself, I would love if someone buy me a bunch of refills. My only complain about it is that the magnet at the back is not strong enough for its weight. 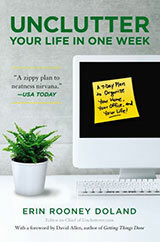 I stick it to the side of my filing cabinet, and it slides down at the rate of 3″ per day. If I go a week without using it, I’d find it on the floor. @bobbin — You must be much stronger than I am, I can’t rip those fake credit cards that persistently come in the mail into pieces. I burn most of my junk mail. Fireplace, gas grill, barbecue, ash tray, patio fireplace, gas log – most folks have a place to burn things. I have on occasion, remailed anonymous junk mail in postage paid envelopes to other junk mail generators. Is fun!!! I do not think that many of these things are very useful. There are already options that you can find at home, such as using regular scissors to shred paper, yarn/ string to tie up cables, masking tape for labels. For the charger, I dont really see any use for it. Well, I guess maybe some of these things would be useful for someone that has difficulty working with these things, such as someone with arthritis or any other physical difficulty. Sorry for being so critical. I’ve had shredding scissors for 2 or 3 years now and wouldn’t want to give them up. You don’t have to shred the whole receipt/piece of paper, just enough of the identifying info. I keep them by my desk for opening mail. Plus, since they’re stainless steel, I bought another pair for the kitchen. Very efficient at mincing herbs! When I originally bought them, it was for paper crafting and I still use them for that, too. My Dymo Letra Tag qx50 has been in regular use for about 4 years now and I love it. I have a lot of files and notebooks and I use the labelmaker for labeling the binders, the dividers, cover sheets that hold documents, file folders, shelves, cabinets at work, jars, boxes, small dividers inside other boxes. My most useful labels have been on the cables that come on electronic appliances. I now know what goes with the graphing calculator, or the scanner, the telephone or the crockpot. Before I was always worried that if I got rid of a cord, I would not be able to use a certain appliance. I’ve been wanting those shredding scissors for a while now! I don’t have a lot of things to shred, so I don’t want to spend the money for an actual shredder…but I would like a better option than cutting with regular scissors or tearing! I think the phone holder is nifty. I wouldn’t mind having one of those! Cheaper than a charging station, for sure. I think the bottles were $14.95, but I know I found a coupon either on the website, or at retailmenot.com. Most of my friends have stopped using plastic water bottles, but we all talked about how dehydrated we feel at work, since our filtered water cooler water tastes disgusting. I used my bottle today, and I think everyone I’m giving one to will be very happy. If you’re receiving junk mail that you don’t want to receive, there are usually ways to opt out. All credit card offers have a number you can call to opt out of the mailings, and you can usually do something similar with catalogs. It seems like this is the real solution to lowering the amount of junk mail that makes it into the home. 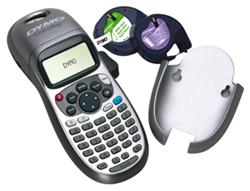 Count me in as another happy Dymo labelmaker customer – I’ve had one for nearly 10 years, and use it frequently both at home and my office. Toting it back and forth is the real pain in the neck, but I refuse to clutter up my life by purchasing a duplicate that will sit in a drawer most of the time. I think the shredding scissors will come in handy at our mail table just inside the front door. We have an electric shredder, but with little kids, we don’t leave it in a public area, much less plugged in and ready to use. I could hang these up above the mail table, out of reach, then use them to cut up the credit card offers. Also, I have a Dymo label maker and LOVE it! It’s great for storage and labeling things in the kids’ room. – Wine pumps: for your wine-loving friends. You use them to get the extra oxygen out of bottles with leftover wine; the wine keeps up to a week or two using these (as opposed the usual 1-2 days). – Wine charms: enough said; good for people who have stem glasses and throw lots of parties. – Soap and shower gel: will definitely get used up. I’d like one of those boxes to organize my sewing thread by color…. As a teacher, I think those shredding scissors would come in very handy. I often have things that I don’t want to just throw away (confidential information and the like) in recycling but don’t want to haul up to the office to shred. Having those at my desk so I can give a few quick snips to protect a students privacy seems mighty handy. Given the small space they take up . . . seems like a no-brainer. I’m constantly amazed at the need people have to take “won’t work for me” and turn it into “won’t work for anyone.” They’d work nicely for me, thank you! 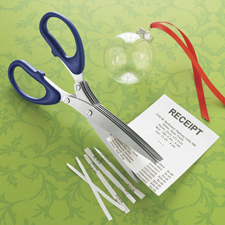 The scissors are great for just removing names, addresses and account number from pages. In our area shredded paper can not go in the recycling. Using the scissors I can remove confidential info and recycle the rest. It is quite a lot that doesn’t go into the landfill. I’ve always hated that snide, cynical, and overly critical attitude. Another observation that I’d like to add to the mix is that people who say things like “Why do/buy/use X, when you can just use the existing Y?”… never, ever actually themselves do Y.
I have had the shredding scissors for a while now and I really don’t like them at all. It’s hard to cut anything thicker than 2 sheets, so if you want to keep that credit card offer folded up to save some time cutting, think again. Anyway, ripping junk mail into little pieces is a nice stress reliever after a long day at work.